In my list of greatest Pixar films, Cars 1 and 2 are placed last and second to last. This has not stopped them from appealing to the younger generation and the Cars toy range sells by the truckload. 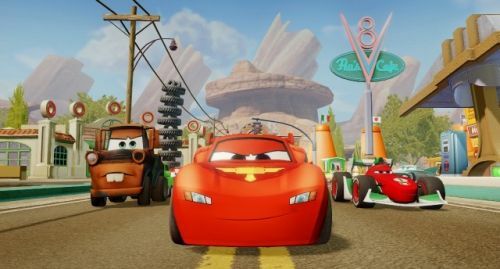 Therefore, when Disney Infinity was announced; a game that combines 4 player co-op with collectable toys, the introduction of a Cars pack was always likely to rev up pretty quickly. Check out the new trailer for a trip round Radiator Springs. The initial Starter Pack for Disney Infinity includes Play Sets for Monster University, Pirates of the Caribbean and The Incredibles. The Cars pack is the first to be released separately and hints of what is to come. The packs will set you back as much as $34.99 and contains up to 4 cars to play with, but also a virtual Radiator Springs to play in.